ଏକ ପାରମ୍ପରିକ ନଦୀବନ୍ଧର ସରଳ ରେଖାଚିତ୍ର. ↑ "History of Hydropower". U.S. Department of Energy. ↑ "Hydroelectric Power". Water Encyclopedia. ↑ Worldwatch Institute (January 2012). "Use and Capacity of Global Hydropower Increases". ↑ Bent Sørensen (2004). Renewable Energy: Its Physics, Engineering, Use, Environmental Impacts, Economy, and Planning Aspects. Academic Press. pp. 556–. ISBN 978-0-12-656153-1. ↑ Robbins, Paul (2007). "Hydropower". Encyclopedia of Environment and Society. 3. ↑ "Executive summary of Power sector, April 2017" (PDF). Retrieved 25 May 2017. ↑ "Renewable Energy Physical Progress as on 31-03-2016". Ministry of New & Renewable Energy, GoI. Retrieved 14 June 2017. ↑ "All India Installed Capacity of Utility Power Stations" (PDF). Retrieved 13 April 2016. ↑ "India remains major competitor in global hydropower". Retrieved 17 April 2016. ↑ "Status of Hydro Electric Potential Development in India" (PDF). Retrieved 17 April 2016. 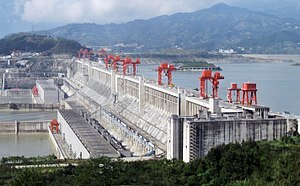 ↑ "Hydropower - Too slow to be steady". Retrieved 17 April 2016. ↑ "River basin wise hydro potential in India, CEA". Retrieved 23 June 2017. ↑ "AN OVERVIEW OF HYDRO-ELECTRIC POWER PLANT (PDF Download Available)". ResearchGate (in ଇଂରାଜୀ). Retrieved 2017-02-21. ↑ "Pumped storage hydro power plant" (PDF). Archived from the original (PDF) on 7 July 2014. Retrieved 27 August 2014.